War never changes. But war games do. Strategy games on Android have become more impressive and complex over the years. The conquest of the world lies in the palm of your hand, if you can outsmart your enemies. We've picked out the best strategy games on the Play Store to test your tactical mind. The Total War games are a well-known strategy franchise on PC, famous for immersive battles, historical accuracy, and huge numbers of soldiers on screen during heated battles. Now, thanks to modern smartphone hardware, we see the classic Rome: Total War arrive on the Play Store, with new controls optimized for touchscreens. As the name suggests, Rome: Total War is set in the ancient world, with focus on the Roman Empire and its famous legions. However, you also fight against (and fight as) various other ancient armies from rival empires and barbarian peoples, such as Egypt, Gaul, Britannia, Macedon etc., for a total of 19 factions. Aside from the real time battles, in which you can control your units directly from a birds-eye view or zoom into the thick of it, you also plan your long-term moves in a turn-based strategic map. Politicking, diplomacy, trading and building your economy are as essential as battlefield tactics to triumph. With fantastic graphics, hours of gameplay and many factions to try, Rome: Total War is well worth the asking price, but the hardware is demanding - make sure you check the compatible phones on their Play Store page before you buy! The brainchild of X-COM creator Julian Gollop, Chaos Reborn: Adventures is a challenging strategy game that you can really sink your teeth into. The game is fantasy themed - two wizards face each other across a hexed battle map, summoning creatures and casting spells to defeat their rival. Chaos Reborn is a premium game which also exists on PC and asks for an equivalent price on Android. But for your 10 bucks, you get a deep, challenging strategy game which doesn't hold your hand. It's tough and it takes a while to get the hang of all the mechanics and options at your disposal. But when you do, you have a great strategy game with an offline single-player story campaign and competitive multiplayer where your own skill is rewarded - not how much money you spent on in-game advantages or loot boxes. And winning at Chaos Reborn is definitely rewarding...it's a complex game, with elements of RPG, card battles, chess and even poker, such as positioning, combining colors and elements, bluff, and chance are all a factor. Aspiring warlords looking for new worlds to conquer shouldn't be put off by the price. Gladiabots is a fun strategy game in which teams of robots battle each other, but with a special twist - these robots are autonomous, so rather than control them directly, they follow the AI that you have programmed for them in advance. Programming? Not so fast. You don't need to take a coding course before enjoying Gladiabots, but you still might learn something about AI along the way. The programming instructions for your robot team is done via simple flowcharts where you can set actions and conditions that dictate how each bot behaves in different situations. It sounds complicated but the game teaches you the basics through a well-designed sequence of tutorial levels that introduce you to different concepts step by step until you're ready to program a full team. Once you're ready, it's time to throw your team into battle against CPU and human opponents (cross-play is supported with the Steam and iOS versions of the game). There are several different robots to choose from with different strengths and weaknesses, so your team makeup and positioning matters. However, the main challenge is making your robots smarter than the other side, since your enemy only has access to the same units you do. After playing Gladiabots, I swear I'll never laugh at the stupid AI in video games again, now that I have got an idea of just how tricky it can be. Aside from this insight, Gladiabots is a great strategy game, and really addictive and challenging as you refine your AI to make the perfect competitive team. Planar Conquest is a massive Civilization-style strategy where you take on the role of a powerful sorcerer who raises fantasy armies of orcs, elves, undead etc., and embarks upon a conquest of many worlds with different terrain types and effects. Based on the classic Master of Magic by Microprose, fans of the Heroes of Might and Magic or Age of Wonders games will also find a lot to like in this. There's a lot of depth in this case as you'll have to manage your economy, scouting, city production and spell research, as well as making tactical choices in the turn-based battles that occur when you clash with your rivals. With so much to manage, the game can be overwhelming on smaller screens but thankfully there is a comprehensive tutorial to get you used to all the different menus and actions you'll be taking throughout the game. Once you get the hang of it, Planar Conquest is an engaging and rewarding game with tonnes of content. Just be warned: the starting price of $4.50 gets you just four races out of eight, and only three terrain types. The rest are unlocked via IAP, but both the base game and extras are often on sale. Back in 2015, Pixel Toys released Freeblade, a fun mech shooter that turned out to be one of the best mobile games based on the popular Warhammer 40,000 strategy tabletop game. Now, they are coming back to the franchise and bringing Warhammer: Age of Sigmar to smartphones. Age of Sigmar is a relatively recent offering from Games Workshop - a reboot of the popular fantasy franchise that has also had video game hits in the form of the Total War and Vermintide games. 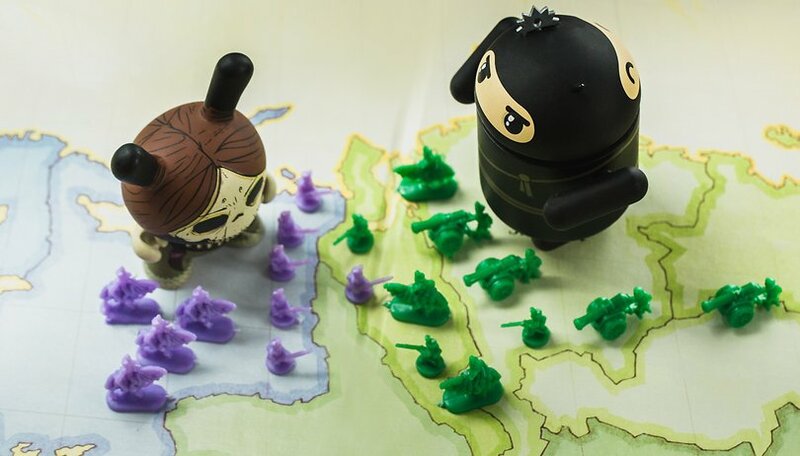 Pixel Toys' interpretation of the tabletop skirmish game is PvP focused. You collect cards and build armies with which to fight other players head to head in graphically impressive 3D battlefields. The end result is a blend of Games Workshop characters and moves with a format reminiscent of Supercell's popular Clash of Clans, where you send your units to destroy an enemy tower for victory. That doesn't mean that Age of Sigmar brings only visuals to the table. The special characters and monsters from the tabletop game can make all the difference in battle, and there are multiple lanes to attack and defend. It's too early to tell whether Age of Sigmar will take off as a mobile eSport, but it's got more than enough flair to enjoy as a casual strategy game. There's an AR mode too, which lets you display the battle unfolding on your real tabletop, living room carpet, kitchen counter, etc. Battlevoid takes you into a not too distant future, in which mankind has mastered intergalactic space travel. You command a single spaceship at first, later an entire fleet. The goal is to protect humanity from hostile enemy alien civilizations, with various factions challenging you in different ways. Space battles are real-time, but still not too hectic - sometimes a bit lengthy. Missions bring you the resources to increase your fleet. There are roguelike aspects at play here: areas are procedurally generated with random elements to make every expedition different, which lends a lot of replayability, but can make things harder when luck isn't on your side. Expect to die (permanently!) and learn from mistakes and experimentation. Battlevoid: Harbinger is best played on a large smartphone display or even tablet. If you enjoy it, the same developers also offer a real time (rather than turn-based) space strategy game in the form of Battlevoid: Sector Siege. Plague Inc. has been available for several years, but has not lost any of its charm. Whether it is morally reprehensible to spread a plague all over the world and thus extinguish people is something everyone must decide for themselves. The fact is that Plague Inc. is an excellent strategy game in which the player is given many tactical options to... bring a plague over humanity. You will be introduced to the system by a comprehensive tutorial in which you will try to infect over 50 different countries with 12 different types of disease. On the way to full spread, you'll have to make decisions over and over again to spread faster. This is exciting, tricky and a lot of fun. PS: Choose cold resistance to grab Greenland! XCOM: Enemy Within is a turn-based PC strategy game that was ported to Android a couple of years ago and still impresses with top graphics and hours of content. You control a squad of fighters called upon to resist an alien invasion of Earth. The XCOM series is famous for its unforgiving enemy AI, which often puts you under a lot of pressure. You'll find yourself growing very fond of your XCOM squad over the course of many tactical battles, as they collect ever better equipment and skills and keep you invested in the fates of individual soldiers as the game goes on. Some moves trigger cutscenes - the graphics are really excellent. The multiplayer mode is also very well done. All in all, XCOM: Enemy Within is one of the most complete video game experiences on Android. It weighs in at over 1GB, but if you've got the space, it's well worth the 10 bucks. The Battle of Polytopia is a charming combination of strategy and adventure that has you assume the role of a tribal leader, on a quest to explore and conquer new lands. Naturally, there are rival tribes out there who will challenge your supremacy. The cute, blocky graphics are attractive but also undemanding, which helps this game run smoothly on most devices. The choice of tribe determines the type of adventurer you start with at the beginning of the game, but you can new abilities and units can be researched along the way, so you have a lot of flexibility to develop your strategy. Procedurally generated maps and a variety of tribes and environment helps keep gameplay fresh. While Battle of Polytopia isn't as dense as a fully-fledged Civilization-type game, this is an advantage if you want to get on with the action in a short play session without fiddling with too many numbers for trade or diplomacy. Battle of Polytopia has no ads, but there are in-app purchases to unlock additional tribes. Nonetheless, even the free content contains hours of strategy goodness. Anyone remember the old Command and Conquer real time strategy games from back in the day? Well, Russian app developer Digital Garbage certainly does. And thankfully, its attempts to recreate the old-school RTS experience on Android don't live up to its "garbage" name. Depending on your perspective, this game is a loving tribute to or shameless rip-off of Command and Conquer: Red Alert, complete with a Tesla Tank-touting Soviet Union. The developer also offers Expanse, another RTS that draws inspiration from the classic Dune strategy game. Both games follow the classic RTS format: build your base, harvest resources and train ever-more powerful units in order to amass your army and destroy the enemy base. You can do this as one of several factions each with their own strengths, weaknesses, and flavor. At first there's quite a steep learning curve: there's no hand-holding to explain the controls or units, the tutorials are just maps where the enemy is passive enough to let you learn by playing around and figuring it out on your own. However, once you've got the hang of the basics, RedSun plays really well. Some stuff can still seem obscure though, such as the fact that some units can change into alternate forms, which you'll only find out by double-tapping on them. Although fine micro-management of units is tricky on the touchscreen, the games handily have buttons that allow you to select all of a certain troop type (infantry, armor, air) at once, allowing you to get a bulky army on the move quickly while also being able to control individuals or small groups. RedSun is available in both a free (ad-supported) and premium paid version. It's also possible to make IAPs to buy certain special units, but they don't seem to be necessary for victory, as in my testing I've handily been able to stomp the AI with the regular units. If offing bots isn't your thing, it's also possible to go head to head with human commanders in multiplayer matches over Wi-Fi. Wait, RPG? Don't worry. While there are role-playing elements and a great story in this game, the heart of Templar Battleforce is in squad-based tactical strategy combat. Similarly to how RedSun is a knockoff of Command and Conquer: Red Alert, Templar Battleforce is 'inspired' by Games Workshop's classic board game Space Hulk. You control a squad of elite troops known as Templars, specialist soldiers encased in hulking suits of armor that are tough enough to clear out entire armies of savage aliens using melee weapons and heavy duty firepower. Remind you of anyone? While the concept isn't exactly original, the execution is fantastic, with well crafted maps and scenarios presenting a challenge for the mind. Clearing out room after room of Xenos with your squad, while always facing the tension of what's around the next corner is extremely satisfying. And with so many options to customize your units, you'll get to know your Templars as individuals (and despair when they die). It's a smaller, more intimate scale than the continent (or galaxy) conquering games on this list, but no less tactical and engaging. The full game comes with over 50 levels for $10, but there's a demo of the first 4 levels available for free, so you can try before you buy. A space 4X game for Android? As if I wasn’t spending enough time on Endless Space 2 and Stellaris on PC already, now I can be a galactic space emperor on the subway, too. Uciana is a new indie game that delivers a fantastic amount of depth for your $0.99. There’s no IAP either. What you get is effectively a mobile game version of sci-fi Civilization descendants, such as Master of Orion 2. There are several distinct spacefaring civilizations to choose from. Good ol’ humanity is an option, but I’m a fan of the more exotic types, with the crab-like Sothren Federation being my current favorites. Through the graphics are basic, each comes with distinct bonuses and ship design to give them a different flavor. The goal is galactic conquest. It is accomplished via exploration, expansion, economic growth, technological research, and of course, diplomacy and war once you start bumping in to your rivals. Right now, it's only possible to 'win' the game by conquest, but the developer has mentioned adding in different victory conditions further down the line. Although the turn based system makes the controls easy enough on mobile, this isn't a casual game. Uciana doesn't dumb down the 4X genre at all, and you'll struggle to keep track of all your resources and statistics, and what exactly they mean at first. Though there are a couple of tutorial videos from the devs up on YouTube, you'll mostly be learning through trial and error in game. Nonetheless, once you've spent time getting the hang of it, Uciana stands out as one of the best strategy games out on mobile that isn't tarnished by pay-to-win monetization or predatory IAP. Given that it's early days yet for the game, it has great potential. We hope that you find your next favorite mobile game above and if you're looking for a one-on-one fight, then be sure to also check out our favorite fighting games on mobile. If the selection looks too pricey, there's also some strategic challenges to be in our list of the best free games. Have you tried any of these great strategy games on your Android device? Are there any more you would recommend? Let us know in the comments!